Steal 4 history books from Odral Helvi in Caldera and donate them to Vala Catraso in Ald'ruhn. The chest containing the books. Steal four books from Odral Helvi's quarters in Caldera. 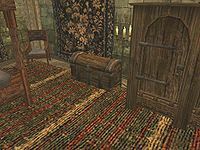 Deliver the books to Vala Catraso in Ald'ruhn. Return to Jim Stacey to complete the quest. For the sixth quest in this series, Jim Stacey wants you to steal Odral's History of the Empire 1, 2, 3, & 4 from Odral Helvi in Caldera and donate them to Vala Catraso in the Guild of Mages in Ald'ruhn. Odral Helvi can be found upstairs in the Governor's Hall in Caldera. The four books are found in his bedroom inside a locked chest next to the bed. Travel to the Guild of Mages in Ald'ruhn and donate the books to Vala Catraso in the name of the Bal Molagmer. Return to Jim Stacey in Vivec for his congratulations. The Secret Caldera Ledger in the same chest is required for a Redoran quest and can be used to bribe Cunius Pelelius in an Imperial Cult quest. 10 Gentleman Jim Stacey asked me to steal Odral Helvi's exquisite copies of "A Brief History of the Empire" and deliver them to Vala Catraso in the Ald'ruhn Guild of Mages. Odral Helvi is in the Governor's Hall in Caldera. 30 Vala Catraso accepted four volumes of "A Brief History of the Empire." 50 Vala Catraso accepted Odral Helvi's copies of "A Brief History of the Empire." 100 Finishes quest Gentleman Jim Stacey thanked me for stealing Odral Helvi's "A Brief History of the Empire" and delivering it to Vala Catraso in the Ald'ruhn Guild of Mages. This page was last modified on 10 July 2018, at 02:23.